African violets are common house plants that are beautiful to look at. 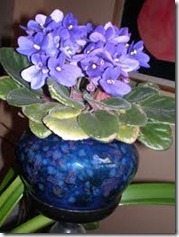 African violets are not very difficult to keep healthy, but they do have certain needs they require in order to survive. Keep your African violets indoors only and by a window. African violets like to get a bit of sunlight each day. If you can put your flowers in a window looking out to the east, they can get their needed sunlight every morning. Water your African violets only after you have let your water sit in your watering can for eight hours or so. This will let any water impurities evaporate into the air. African violets do not do as well with chemicals that are found naturally in tap water. Place the watering can near the soil of your African violets pot when watering the flowers. The leaves of African violets should not get wet if you can help it. 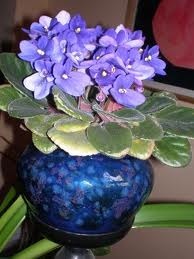 Water your African violets any time the soil that they live in becomes dry. You might have to check the soil for moisture every couple of days. Dry any water that drips onto the leaves of African violets immediately upon noticing the water drop. Water drops can cause dead spots on the flowers of African violets. Place African violets only in climate-controlled areas. African violets can die if there is extreme heat or extreme cold. If you set the thermostat in your home carefully, your African violets should do just fine.